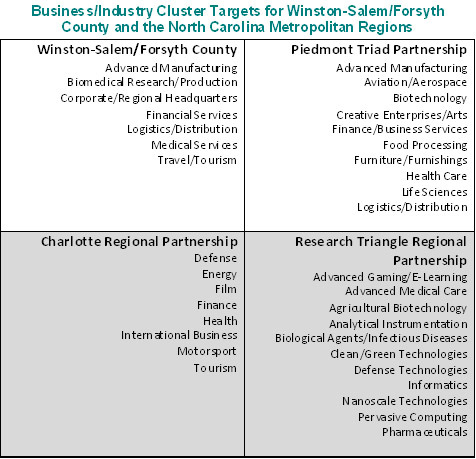 In addition to the businesses and industries targeted by Winston-Salem, Forsyth County and the Piedmont Triad, are there other business and industry groups to target for which we may be well-suited? Companies that manufacture equipment for the entertainment industry. Active senior communities for varied income levels in an industry that is well suited to our area. Support health services, improving environmental quality plus the beauty and livability of downtown. Walkable communities require nearby work areas, green spaces and artistic programs. We should target industries producing new age technologies that reduce carbon emissions like wind and solar, green buildings, bioengineering (environmental field).